MHS seniors traveled with their temple for the Career Internship Program to rebuild homes. Montclair High School seniors Claudia Stagoff-Belfort, Lila Taylor, and Sydney Miede, all members of Temple Ner Tamid, used their Career Internship Program to work with their temple to help people in need. The temple has been partnered with Habitat for Humanity for a few years now and every year they fly down to New Orleans, Louisiana to help rebuild homes, specifically homes that were destroyed in Hurricane Katrina so long along. 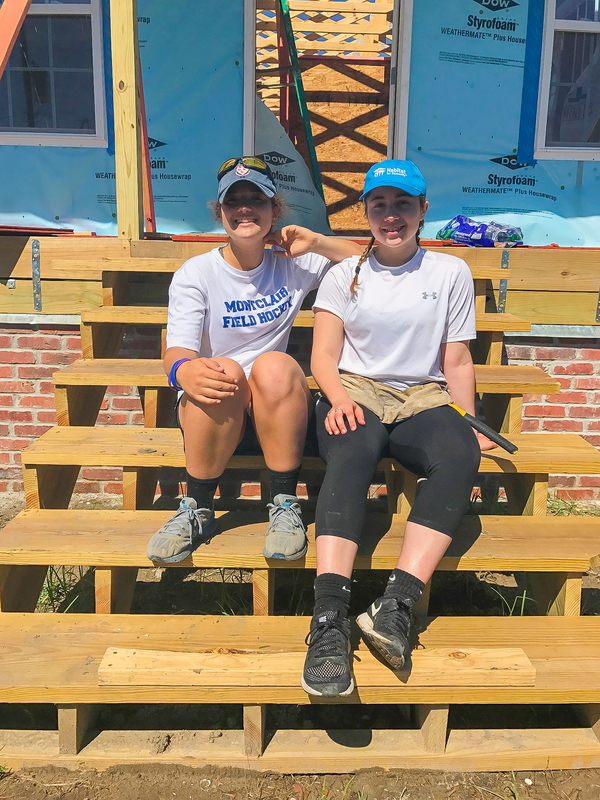 “The work was physically harder and I definitely learned how to build a house straight down to the core” stated Stagoff as she reflected on her trip. For three days, the group worked on-sight in New Orleans east, and then one day on a different house in the Lower Ninth Ward. They painted, caulked, hammered, put up wood paneling, and more. Not only did they do labor, but they brought bags of food they had made to local covenant houses and worked with The Animal Rescue of New Orleans (ARNO) which was the only non-kill shelter in the area. Lila Taylor [left] and Claudia Stagoff-Belfort [right]. Photo courtesy of Lila and Claudia. The group also became deeply invested in learning about the culture of New Orleans. They quickly discovered how the people of NOLA are very in love with their city. Stagoff explained that even though the homes they were rebuilding were still in the possible flood zones, the people of New Orleans wanted to remain in the same area. They have such “such a deep rooted community, many families had lived in the same houses and areas for generations and generations which is something they weren’t quite ready to give up on” according to Stagoff– something she was extremely impressed with. Though their work in New Orleans was more difficult than expected, it was very rewarding. Miede was eager to share her experience in New Orleans, explaining that when the group began work on a house, there was no roof, but when they left, there was a full and stable roof built. Simple things like painting the interiors and exteriors of houses really made a difference, transforming a house into a possible home. “I actually don’t think I realized how much of an impact I would actually have… anyone we encountered within the community of New Orleans thanked us for our work and it really made you feel like you made an impact there” Miede explained. In the fall Sydney Miede will be attending The University of Michigan as a dance major, Lila Taylor will be attending McGill University, and Claudia Stagoff- Belfort will be attending Wesleyan University. These skills they learned through this experience won’t necessarily help them in their future careers, but the lessons they learned surely will.